Do you want to feel energized and inspired? Work with life’s energies through practical physical exercise. Life Counseling: Who Are You? Let me guide you on a personal journey with the 'Nan Yar -Who Am I' cards. Nan Yar (=’Who Am I?’) is a personal development card game designed by me, based on the ‘Marseille’ Tarot. 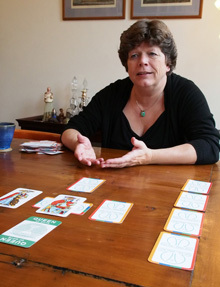 I use the cards in my Nan Yar Life Counseling consultations to help you explore who you are and what you are capable of. The game mirrors the inner knowing you were given at birth and offer you 78 contemplations to make your world a better place. Next to booking an individual card reading it is also possible to participate in a one-day Nan Yar group training, in which you learn to use the cards as a personal life coaching tool. Ready for some Self-study? Buy the Nan Yar game and its explanatory booklet. Your personal copy of the game and its explanatory booklet are included in a Nan Yar group training. Similar to the Tarot, the Nan Yar game consists of 78 cards. Each card offers a unique combination of a number with an archetype or one of the four ‘colors': Challenges, Insights, Gifts and Tools. The magic of the cards is that they are ‘read’ with the subconscious. Deep down inside you know what you need to feel inspired. It are often the expectations and happenings from outside that distract you. The meaning of each card resonates with our ancient inner knowing, which surfaces when invited to do so. Draw a card as introduction to the Nan Yar game. Click on the button below the card for an explanation or view all Nan Yar – Who Am I cards. With my blog I try to inspire you in a positive way.